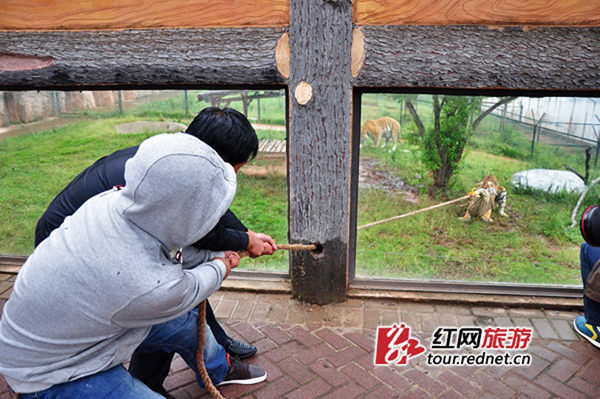 A tug-of-war game between tourists and an Amur tiger in the Changsha Ecological Zoo has caused controversy among netizens as to whether it breaches national regulations. A tug-of-war game between tourists and an Amur tiger in the Changsha Ecological Zoo has caused controversy among netizens as to whether it breaches national regulations, the Beijing Youth Daily reported. Several human-tiger tug-of-war games were held in the zoo at 11am on Friday as a trial of the activity. To attract the tiger, a live chicken was placed in a sack tied to a rope. It was reported that seven tourists lost to a four-year-old Amur tiger, and such game will be officially launched during the upcoming National Day holiday. Many netizens thought the games between human beings and tigers are inappropriate, and some worried that the tiger may lose its teeth. But the zoo side responded that the tug-of-war game aims to train the wild Siberian tigers and stimulate them. According to a regulation released by the Ministry of Housing and Urban-Rural Development of the People's Republic of China in July, all kinds of animal shows are banned in zoos. A tug-of-war game between tourists and an Amur tiger in the Changsha Ecological Zoo has caused controversy among netizens.